"Beagles have an understated, dignified quality about them (well, what I mean is that mine did). They’re not always serious, but they are dedicated." And so the race to find the perfect beagle begun. First I had to check if I remembered how a real beagle looked. Googled it. Then tried to draw a beagle from memory. After clarifying an image of a beagle I had to decide how to draw dignity. This person really admires dignity in beagles. It says a lot about the man. Lets put them all together - the man, the dog and dignity. I made a quick sketch. The beagles are on the lookout - like proud captains of a huge ship they look for approaching dangers to divert them with a bark or bite. Eh... I can do better. Lets make the beagle a real captain facing real dangers. 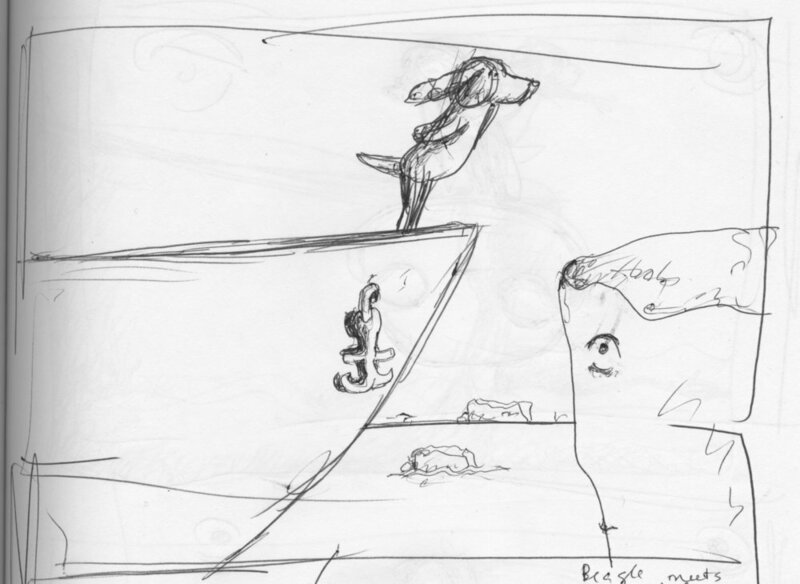 Although Beagle looks dignified now, after his ship butts heads with the iceberg, he may not. Scrap this idea. 2016 was a bad enough year for all of us, no need to remind people how vulnerable this dignity thing is. Beagle must lead the ship to a better place, or to find something that's missing. Maybe tracking a trail lost in an ocean of smells? A beagle can lead a beagle. Lets try that. - I am a beagle and I am like an eagle! Lets see if there is a better angle to look at Beagle leading a beagle. Yes, this beagle is right on the nose! But wait!... beagles have beautiful ears. So warm and fuzzy one could eat them. Enwrapping ears. I have to remind myself that the thing about beagle I was asked to draw was dignity. What could be more dignified than giving a speech at United Nations? - We, all the beagles. The problem with giving a speech at United Nations is with all those people wanting to know you afterwards. And, God forbid, they may want to bring you to strange rooms and surround you. You try to run away but they run after you. Even if you escape, they still send you presents. Only after they leave, Beagle is able to take a good look at people. But it is obvious Beagle has something that people are drawn to. Finally Beagle was able to shake people off. But life wasn't the same without them. He had to find them again. People didn't like that Beagle lost them. To please them Beagle does whatever people ask. Beagle soon gets tired of the chore to feed people. He puts them in a biodegradable bag with marinade and puts a weight on top. Beagle steeps people in the marinade for three days then puts them into a pot. He gives the pot to charity. But life without people is indeed not much fun. So Beagle finds some seeds people left on the floor and plants them in terracotta pots. But even planted in small pots people still have their own mind. Wait, where was I? I had to make a drawing of a beagle with dignity. Stop fooling around! I think I had a perfect Beagle at some point but I lost him in the process.